McNutt Hall houses the College's Admissions Office. Regular decision results for the Dartmouth Class of 2023 come out tomorrow, and they’ll be arriving in the wake of a recently uncovered college admissions scandal that has shaken the nation. The multimillion-dollar scandal includes coaches and administrators at elite schools across the nation. Even celebrities like actresses Lori Laughlin and Felicity Huffman have been publicly criticized for their involvement. As colleges and universities, including fellow Ivy League member Yale University, scramble to review applicants, students and alumni potentially involved in the scandal, conversations about the controversy and its implications on the greater college admissions process are ubiquitous across social media platforms. 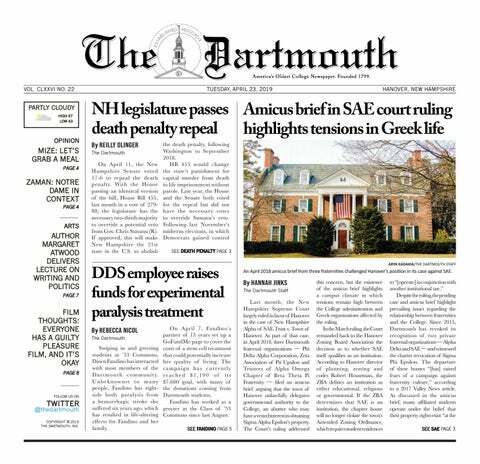 Dartmouth has not been named as being involved in the scandal, but that hasn’t kept members of the College community from weighing in on the situation and expressing their thoughts. One needs only to log into Facebook or Twitter to see waves of students criticizing everything from legacy admissions to affirmative action and unequal access to college prep resources like expensive tutors. As of this article’s publication, neither President Hanlon nor the Office of Admissions has released a public statement regarding the scandal, though many students are hoping that the College will take tangible steps towards making the college admissions process as fair as possible. Lauren Jones ’20 found out about the scandal while boarding a plane before spring break. She had heard that one of her favorite YouTubers Olivia Jade was all over the news, which made following each update about the scandal especially compelling. For Jones, the scandal itself wasn’t especially surprising, as she had attended a high school in which many students were coming from privileged, affluent backgrounds and could afford resources that were inaccessible to many others. She did struggle, however, with trying to make sense of each student’s culpability in the situation, as subsequent news reports revealed that while some students were fully aware of their parents’ actions, others had been oblivious until news leaked to the press. How do you quantify who deserves a college education? Jones struggled with answering this question, mentioning that at her high school, some students criticized athletes who supposedly didn’t deserve their spots even though they were working incredibly hard at an activity outside of the classroom. Similarly, she isn’t sure how anyone can say that one student’s activities and commitments are more important than those of another student. Jones also explained that many students view other students as “less deserving” of an admissions offer based on structural and implicit biases. Tamara Gomez ’21 is a student who has several identities that places her in the minority at Dartmouth. She self-identifies as an international student, having grown up in Mexico before moving to the U.S. partway through high school, and she is also the recipient of both a QuestBridge and a Jack Kent Cooke Foundation scholarship — both of which are given to high-achieving students from low-income backgrounds. Gomez learned about the scandal while checking the News app on her phone, and she said that she was surprised not by the scandal itself, but rather by the fact that it was finally becoming a front-page story. For her, parents’ willingness to go to such extreme measures to get their kids into college was always pretty obvious. According to Gomez, it’s probable that “this kind of thing” happens at Dartmouth, although perhaps not in as extreme a manner. That said, Gomez believes that the Dartmouth student population is fairly well-composed, although she would like to see more diversity among the international student population specifically. She pointed to the removal of need-blind admissions for international students in 2015 as an obstacle that kept many great international applicants from attending Dartmouth, though she hopes to see international need-blind admissions return as part of the College’s Call to Lead campaign for its 250th anniversary. Interestingly, Gomez does not object to legacy status as one of many considerations for admission to Dartmouth, describing a certain school loyalty with which she was unfamiliar before coming to the States. In general, Gomez would like to see colleges and universities use the money from the scandal to help better the experiences of students from less affluent backgrounds, such as through funding better support services and affinity spaces. She knows many students, both at Dartmouth and at other schools, who have doubted whether or not they deserved their spot in college, and hopes that there’s a silver lining to the scandal in the form of increased awareness and support for disadvantaged students. Personally, Gomez has never felt like she didn’t belong at Dartmouth because of her identities. She is proud of the path she has taken, including moving to a new country and pursuing her education in a new language, and doesn’t feel the need to compare herself to others. Jenna Thompson ’20 came to Dartmouth from Harvard-Westlake School, a private school in Los Angeles that she described as “unbelievably competitive.” According to Thompson, the school boasts having at least 15 percent of each graduating class being accepted into Ivy League schools every year. Thompson heard about the scandal over spring break, and similarly to Jones and Gomez, she wasn’t particularly shocked by the news. From her perspective, this kind of behavior has been going on for years. Thompson blamed a greater pressure for students to have attended a school of a certain prestige for the motivations behind the scandal. She expressed sympathy both for the students whose parents were involved and for those who felt like they hadn’t been accepted because of students who cheated their way to an acceptance letter, mentioning that if her parents had been involved in the scandal, she would have felt very insecure about her accomplishments. At the same time, Thompson acknowledged the privilege of the students whose families had been rich enough to take part in the scandal in the first place, and unlike Gomez, she is wholeheartedly against legacy admissions and donations being considered in a student’s application in any capacity. Thompson was accepted to Dartmouth as a recruited athlete, and while she knows that the recruitment process is also not free from privilege granting certain students unequal advantages, she believes that at least athleticism in and of itself is more accessible for students from a wide array of backgrounds. Legacy status and donations, however, are inherently inaccessible to all students except the wealthiest. Another potential change to the admissions process that Thompson strongly supports is the introduction of name-blind admissions. She explained that admissions officers shouldn’t be able to see the names of applicants or their parents because, unless a student is related to someone famous, those names don’t contribute anything. Names like Laughlin’s are recognizable, which gave her daughters an upper hand in the admissions process, creating yet another unfair situation for the vast majority of applicants.